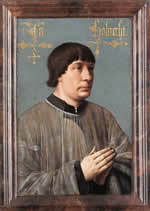 Born the son of a city trumpeter in the city of Ghent, Obrecht acquired a reputation very early as a composer Wunderkind. His music began circulating in manuscript more rapidly than the music of the slightly elder Josquin Desprez. Serving as choirmaster in a number of northwest European cities such as Bruges, Antwerp and Cambrai, Obrecht apparently never stayed too long at one post. Following him was a trail of overstayed leaves of absence, misappropriated funds, and neglect of his regular duties as choirmaster. His restless temperament twice led him to Italy where he cultivated the patronage of Ercole I, Duke of Ferrara. He did secure an appointment at the Ferrarese Court in 1504 but, sadly, lost it almost immediately due to his patron's untimely death. Obrecht himself succumbed to the plague the very next year.